Mr. Thomas Bobyn, Mr. Grant Frey and Mr. Micah Hesman were thrilled to attend the DraftKings conference with the class of 2020 MBA Sports and Recreation Management with the support UNB's business administration and kinesiology faculties. During the planning process they discovered DraftKings was holding an international business pitch competition in conjunction with the conference. 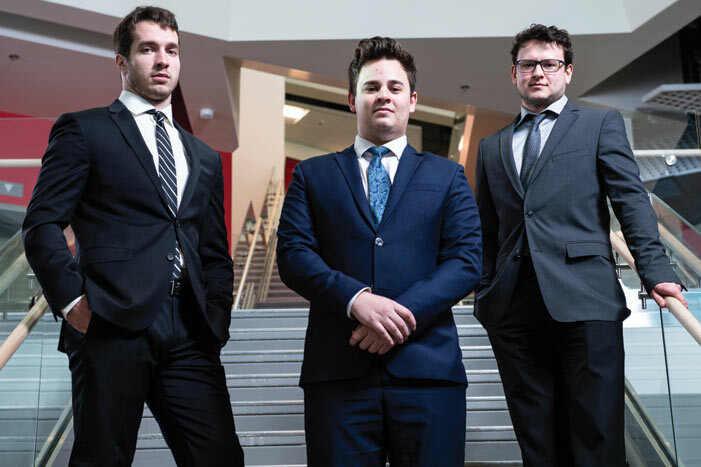 The three UNB students presented the winning pitch on March 1. In January, the UNB team submitted their idea of an Overwatch eSports fantasy format to DraftKings, a daily fantasy sports contest provider. In the submission, the UNB team created a unique format and points system and highlighted the advantages of their game in comparison to other growing eSports. They received a phone call from DraftKings employees in February notifying them they were chosen as a finalist in the pitch competition. During the finals in March, the UNB team had five minutes to pitch their idea followed by a five-minute question and answer period from the panel of judges composed of DraftKings executives, MIT professors, and analytics industry experts. Mr. Bobyn, Mr. Frey and Mr. Hesman won a team cash prize of $2,000, an opportunity for summer internships with DraftKings, and lunch with Jason Robins, CEO of DraftKings. Over the coming week and months, the UNB team will learn how DraftKings is implementing their idea and decide if they will accept the summer internships with DraftKings. The UNB team was the only Canadian team to advance as a top five finalist and selected to present and pitch their idea at the conference. The other four finalists were from Boston University, Rutgers, and two teams from New York University.